Two-Tone Sterling Silver Heart Necklace Just $15.99! Down From $100! You are here: Home / Great Deals / Black Friday Deals / Two-Tone Sterling Silver Heart Necklace Just $15.99! Down From $100! 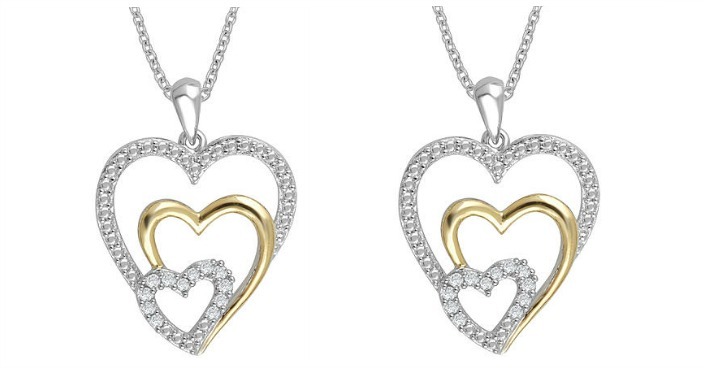 Sears has this Two-Tone Sterling Silver Heart Necklace on sale for $15.99 (Reg. $100)! Plus you can get FREE shipping on orders over $49 or you may be able to get FREE in-store pickup! The Two-Tone Sterling Silver Diamond Triple Heart Necklace pairs with other jewelry and outfits beautifully. Featuring a distinct pendant, two of the hearts are crafted from polished sterling silver while the middle heart is made with an elegant yellow plating. Glistening round-cut diamonds accent the third heart to create an elegant appeal. The pendant rests striking 18″ silver chain, and the spring-ring closure keeps necklace secure around your neck. Whether you’re giving this stunning piece as a gift or adding it to your collection, this necklace is sure to add extra style to any look.